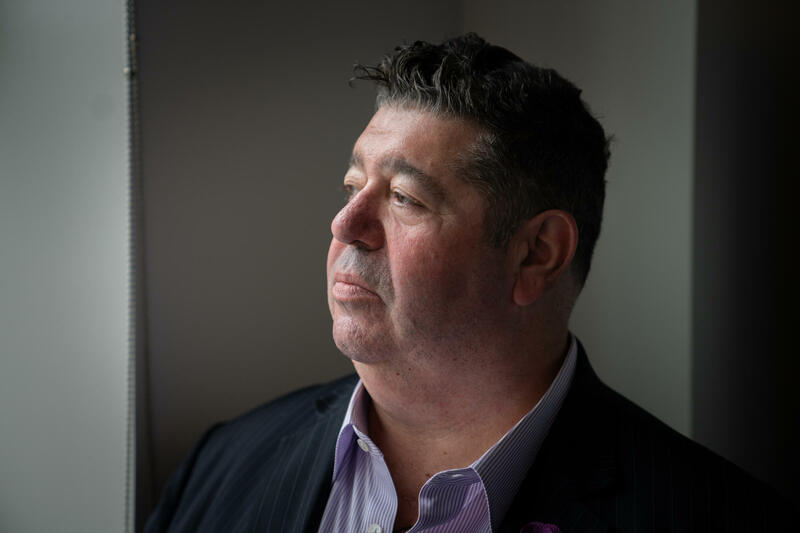 British publicist Rob Goldstone sent an email to Donald Trump Jr. that proclaimed "Russia and its government's support" for President Trump in the summer of 2016. Goldstone has become a surprisingly crucial part of the Russia imbroglio. Yes, Goldstone says, his client, Russian pop singer Emin Agalarov, did ask him to reach out to Trump Jr. and communicate the offer of help that Emin's father, Aras, said he'd received from someone influential. But the email's reference to "the crown prosecutor of Russia" — which led subsequent reports to identify the person as Yuri Chaika, Russia's chief federal prosecutor — was all Goldstone, he now says. The message may be the "most famous email in history," Goldstone says — or at the very least, the most famous email of the Russia investigation. It began a back and forth with Trump Jr. that culminated in the now-infamous meeting at Trump Tower. "I ended up sitting next to Jared Kushner, opposite the 'Russian delegation' as I called them, and [Paul] Manafort and Don Jr. were sitting at the head of the table," Goldstone told NPR in an interview. His description in his interview and in a new book comport closely with what he has said in the past, including in testimony released by the Senate Judiciary Committee. Goldstone says his trade is music publicity. He writes — in the new book, Pop Stars, Pageants and Presidents: How an Email Trumped My Life -- about how he once traveled across Australia following Michael Jackson on tour. Now he has become a central part of the Russia imbroglio. He testified before a grand jury as part of Robert Mueller's special counsel investigation into Russian election interference, and he has also been grilled behind closed doors by three different congressional committees. Trump Jr. released his email exchange with Goldstone in July 2017, after The New York Times told him it planned to publish a story about the exchange. That set off a firestorm of news coverage as details emerged about the Kremlin-connected lawyer, Natalia Veselnitskaya, and lobbyist, Rinat Akhmetshin, who also attended the Trump Tower meeting. Emin Agalarov called Goldstone on the morning of June 3, 2016, and asked him to set up a meeting with the Trump campaign about incriminating information a Russian attorney was offering about the Democrats and Hillary Clinton. "The Crown prosecutor of Russia met with [Emin's] father Aras this morning and in their meeting offered to provide the Trump campaign with some official documents and information that would incriminate Hillary and her dealings with Russia and would be very useful to your father. The email seemed to be black and white evidence of the Russian government's support for Trump's presidential aspirations, as well as confirmation that high level Trump campaign officials were aware of Russia's efforts to affect the election outcome. But Goldstone's current explanation of the email now undercuts the many ways it seems to point toward those conclusions. Reports after the emails surfaced pegged the "Crown prosecutor" as Chaika, the prosecutor general of Russia, and a Putin appointee. The reference seemed to indicate that an official of the Russian government was offering the incriminating documents. But Goldstone now says he was actually referencing Veselnitskaya in the email. Goldstone said "crown prosecutors" in the United Kingdom, where he grew up, were akin to federal prosecutors in the U.S., so he used that term when Emin described Veselnitskaya as a "well-connected" lawyer. Veselnitskaya originally said she had no connection to the Russian government, although she and Chaika are now known to have been in coordination. Goldstone says he didn't know that. "I get it why it's so intriguing to people," Goldstone said. "It is bizarre that she would have a connection to somebody who would hold maybe that title. I just didn't know that." Goldstone's email also corroborated what U.S. intelligence agencies have said for over a year: that Russia favored President Trump in the 2016 election. But Goldstone says he had no insight into how the Russian government felt about the race; instead he says that his reference to Russia's support of Trump was more general: "I had no idea what I was talking about." He now says he was just bloviating — attempting to flatter Trump Jr. in an effort to get a meeting. "It came from the mind that is Rob Goldstone," he said. "But it was based on very specific things. Look, I had been in Moscow during Miss Universe, I had seen how people reacted to [Trump]. I never met a person in Russia that didn't say 'we love Trump.'" Even though Goldstone says Vesilnitskaya didn't end up providing dirt on Hillary Clinton, she did launch into a convoluted presentation that attempted to tie an alleged tax fraud scheme to the Democrats. Trump Jr. has said the political tip was useless and he took no action based on the information he received. All the same, it is illegal for an American political campaign to accept anything of value from foreigners, and opposition research is considered something of value. One of the big lingering questions of the Russia case is what, if any, action the Justice Department might take about this. Meanwhile, the president and his family have repeatedly changed their story in explaining the meeting. At first they said it was only about adoption. Then they acknowledged it was to get information on an opponent, which Trump tweeted last month was "totally legal." As for Goldstone, he says he had a bad feeling about reaching out to the Trump campaign from the moment Emin Agalarov made the request. Not because he knew it would keep his name in the news, and in federal investigations, for months and years to come, but because he was a music publicist who knew nothing about politics being asked to step outside his lane. Goldstone says he told Agalarov just that. "I said, you know, this is a really bad idea and nothing good can come from this," Goldstone told NPR. He says he has received threats and anger, as he's now become a symbol for those who vehemently disagree with Trump's politics. "Imagine how your life would be if people point at you and look at you and take photos and not because you've been successful, but because they hate you," Goldstone said. "It's changed my life in a way I could never have imagined. I hate using the word devastated because there are people who go through far more devastating things than I went through. But it's not far from the truth." Earlier this year, Vladimir Putin announced that Russia had tested a new kind of nuclear missile. Putin declared it a success. But satellite images shared exclusively with NPR suggest the missiles testing may have had a different outcome. Here's NPR's Geoff Brumfiel. GEOFF BRUMFIEL, BYLINE: People usually say a missile is nuclear when it carries a nuclear warhead. But this is something else. It carries a nuclear warhead, but it's also nuclear-powered. BRUMFIEL: In a speech in March, Putin claimed a small nuclear reactor on board can let the missile fly indefinitely. He showed a graphic of it zigzagging across the globe. BRUMFIEL: Putin claimed a nuclear-powered prototype took off and flew in late 2017. But U.S. intelligence was also watching with surveillance. And after his speech, they told the press that based on what they saw, the missile test had failed. Now, civilian arms control experts here in the U.S. didn't have access to military spy planes or satellites, but they got to wondering - could they figure out anything about what was going on? They started looking for clues in Putin's speech. Putin showed some video of what he says was the missile's launch. BRUMFIEL: There were a few visible features in the video - a small building, some shipping containers. Putin also said the test happened in a place where Russia used to test its nuclear bombs, a remote chain of islands in the far north. So these experts started looking, scanning commercial satellite images of the islands from a company called Planet. ANNE PELLEGRINO: It's actually quite beautiful when you look at it when it's just covered in ice in the satellite images. BRUMFIEL: That's Anne Pellegrino, one of the researchers at the Middlebury Institute of International Studies who looked at the satellite pictures. The team eventually pinpointed the spot the missile launched from using clues in Putin's presentation. And then they started monitoring the satellite photos, day after day. A lot of times, there wasn't much to see. It's usually cloudy, so the satellites can't pick up much. But Pellegrino didn't mind. PELLEGRINO: No. It's not boring at all. It's extremely fascinating. BRUMFIEL: Then in July, the team noticed something unusual - a ship showed up, then another ship, this one for handling nuclear fuel. The ships went north to a spot in the ocean near the islands and parked themselves there. Now, according to U.S. intelligence reports, the missiles had flown for a couple of minutes and crashed. Pellegrino and the team did a few quick calculations and figured out where the missiles would have gone down. PELLEGRINO: It would put it smack in the ocean just off the coast. BRUMFIEL: Right where these ships were lurking. Was this a salvage operation? The ships eventually moved away, and then something else happened. The Russians packed up their missile test site and left. Jeffrey Lewis headed the team at the Middlebury Institute. JEFFREY LEWIS: That suggests to me that the program may be experiencing some developmental challenges. BRUMFIEL: If the Russians have challenges, they wouldn't be alone. The U.S. actually tried to develop its own nuclear-powered missile back in the 1960s. The government went so far as to build a test engine on the ground. Sure enough, it seemed like it could fly forever. LEWIS: The downside, at least in the early U.S. designs, was it was spewing lethal amounts of radioactivity the entire time. BRUMFIEL: In the end, the U.S. gave up on its version, but the Russians may have stuck with it. Paul Schwartz is with CNA, a defense think tank based in Virginia. PAUL SCHWARTZ: I don't think you can definitively say that the program has been canceled. BRUMFIEL: He says that it's pretty normal after testing like this to take a pause. SCHWARTZ: It may just be that there are some additional results that now need to be taken back and worked on. BRUMFIEL: Jeffrey Lewis says this is about more than whether the missile worked. The fact that the Russians are designing such an unusual weapon is a sign that they are returning to an old way of thinking. LEWIS: You know, this is a resumption of the arms race. You know, these are the kinds of crazy systems that really mark to the most intense periods of U.S.-Soviet competition. BRUMFIEL: He hopes the U.S. and Russia will consider new treaties, one that would ban unusual weapons like this nuclear-powered missile. Geoff Brumfiel, NPR News. (SOUNDBITE OF THE AMERICAN DOLLAR'S "WUDAO") Transcript provided by NPR, Copyright NPR.